Global Gaming Labs announced in the early part of 2017 that it was closing down its Live Casino Operations. All existing customers of Global Gaming Labs were migrated to Visionary iGaming, in a deal struck during the latter part of 2016. Global Gaming Labs were founded in 2002 and are based in San Jose, Costa Rica. They have been developing Live casino software solutions since 2002 and aim to become the best software provider in the industry. 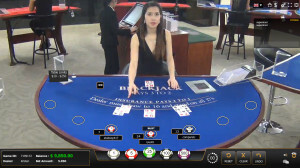 They are a company that likes to innovate and are proud that they offered the first live casino in full screen HD, dual cameras on Roulette and the facility to play out a players hand using basic strategy if they are disconnected during play. Global Gaming Labs are responsive to customers needs and are able to integrate their solutions into existing casino setups. They can install live casino from scratch setting up full private studios with custom branded walls, carpets, tables, cards & uniforms to providing custom tables with branding in their existing studios, which are based in Costa Rica. Specific language speaking dealers can also be provided if it’s required. Isn’t it great when you go to a company website to find out about its products and services and it teases you with bits & pieces of information, but doesn’t actually tell you what you want to know. In my case I wanted to find details of their live casino product, what games they have, where the dealing studio is etc. Of course I found none of this on the website, silly me what was I thinking! A true own goal. Anyway, that didn’t deter me. I persisted, as their product is a good one and deserves to be shared with the masses, well live casino players anyway. So after a few emails with a man at Global Gaming Labs, I’m given access to their live casino system in demo mode and access to someone who is more than happy to answer my questions. This review is focused on the Live Casino Product only and is biased towards players, not potential customers of GGL, but saying that, players opinions count, so this review is relevant regardless of who you are. Six games are currently being offered, Blackjack, Blackjack Unlimited, Baccarat, American Roulette, European Roulette and Casino Holdem and these can be accessed from the lobby. The lobby displays all of the games down the left hand side and indicates the free seats on Blackjack.Each game has the option of multiple stake levels so you’re able to select the limits to suit before joining the table. This is an 8 deck game. No burn cards are discarded after shuffling or before each hand. The dealer takes one card on the deal (European Rules). 7 seats are available with one seat per player. Splits are allowed on any cards that form a pair. A split of a sub hand is not allowed. Split Aces receive only one additional card and if it’s a ten that hand is 21 not Blackjack and can be beaten by a Dealers blackjack. When splitting a hand the first card is dealt additional cards until either the player stands or busts. Then the second hand is played. Doubles are allowed on splits and any other hand value. A Surrender option is available to the player once his first two cards have been dealt. If the hand is surrendered the player will receive half his stake money back. This is an 8 deck game and is fundamentally the same as 7 seat blackjack described above. In Blackjack Unlimited there are 5 playing positions, and a player can play as many of the positions he likes. An unlimited number of players can play in the same way. Each player plays his hands how he wants, so one player may choose to stand while another may choose to hit or double. Regardless of what other players do the outcome of the hand is determined by only the actions that the individual player takes. The major difference with Blackjack Unlimited over normal 7 seat blackjack is when it comes to splitting a pair. If a pair is dealt the player is given two choices, to split or not to split. If he choose not to split then his stake is returned to him minus 20% house commission. The players of the hand have 5 seconds to decide what to do, if no decision is made the hand is automatically split and standard strategy is applied to each hand. This is a good alternative if the 7 seat game is full. Live Baccarat is played with 8 decks and follows the normal Baccarat rules . Three side bets can be placed at the start of each hand. Player Pair – if the player draws a pair, Banker pair – if the banker draws a pair and Any Pair – if either the banker or player draws a pair. Baccarat Road maps are displayed on the screen, so you can monitor trends and hand values using the Big Eye, Small Road, Cockroach Road or the Bead or Big Roads. These are probably the clearest examples of the Baccarat roads that I’ve seen of any Live Casino Software provider. This is the standard European Live Roulette with a single zero. It’s a multiplayer game but you don’t get to see other players chips. There are two cameras in operation with the second one being displayed when the wheel is spinning and focuses on the wheel and ball. Several special bets are available – Snake, Random & 007 and these can be picked from the menus at the top of the screen, that also holds information on the hot and cold numbers. French Bets can also be made using the racetrack, again this is listed at the top of the screen. The betting window is 40 seconds which is about average across the industry. This is American Live Roulette, that has a Zero and Double Zero on the wheel. French bets cannot be made but you can make the special bets of Snake, Random and 007. Live Casino Holdem is played with 1 deck that is shuffled between each hand by the dealer. Because of this the game is slower than some of Global Gaming Labs competitors like Playtech and Evolution, who employ a manual shuffler or use a machine to speed up play. In this game the dealer qualifies with a pair of 4’s or above and a bonus bet that pays on Aces and above can be placed at the beginning of each hand. The playing interface for the games is simple and straight forward. Along the bottom of the interface is the betting bar where you chose your stake, select your rebet options, access the chat interface, adjust the volume and view the betting count down timer. Within the playing interface you have the ability to view settings, which actually don’t allow you to change anything other than the table volume. 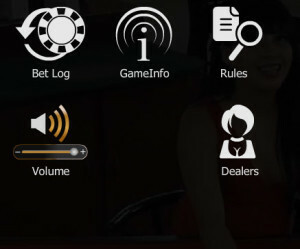 The panel is more for information purposes and there are options for you to view your Bet Log, read the rules of the game, display the game info in a little panel on the table that gives the dealers name, stake range and the language being spoken. The dealer button hasn’t worked when I’ve tried it.! Shuffling is performed manually and normally at the shuffling table which is located in the middle of the dealing studio and visible behind all of the tables. The only normal exception is Casino Holdem, where the dealer shuffles the pack at the table after each hand, but I have seen dealers on Baccarat shuffling at their dealing table. Global Gaming Labs have over 70 Live Casino licensees of their product and I would expect to see this number grow. I’ll certainly be hunting down more that I can review for Live Casino Comparer! The software is very good and from a players perspective has everything that you could ask. The playing interfaces are clean and simple and the selection of games is on a par with their competitors. The quality of the dealers are very good and although their native language is not English they speak clearly and can be easily understood. My only criticism is that the streaming can be a bit laggy at times and the speech isn’t as clear as I would like. The absence of a mixed viewing mode makes it difficult to keep up with play when it is laggy but I didn’t really experience any major issues. Disconnections during Blackjack are handled by standard strategy being applied to the hand which is a much better option than your hand being played with whatever it’s value was at the time of disconnection.